Hi, Today I am up on the My Sweet Petunia blog for Team Tuesdays. I have obtained the newest tool - the Cut Align - it is fantastic. I have trouble cutting small strips and the Cut Align makes this so easy. I also have a card featuring the new Picket Fence Studios Aeonium African Succulent. I will be back soon with a video on the Cut Align! I stamped the image with Picket Fence Black Hybrid ink using my Misti to get a more precise image. I then loosely water colored the image with three shades of blue green. It was so easy to do. I think took one long sentiment from Ways to Say Happy Anniversary and split it using the Cut Align. I then used the Cut Align to cut the then sentiment strips. I have a You Tube tutorial below. Products Used: I am using compensated affiliate links at no further cost to you. I received the stamp as part of my design team work for Picket Fence Studios. The Cut Align was a gift. 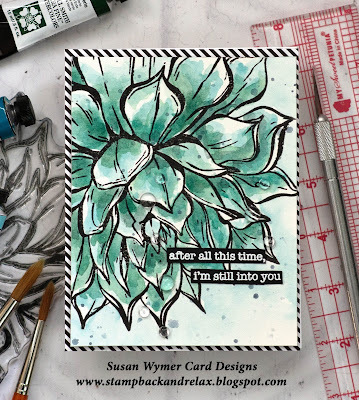 A beautiful card Susan but I didn't see any video posted??? Locely stamp. I am excited about thw new tool! Thanks for the inspiration!